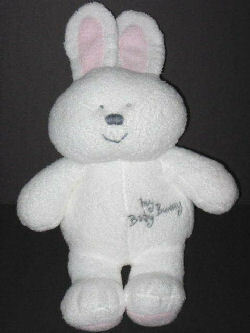 I’m looking for a new, or like new, TY PLUFFIES 2004 white terry rabbit with pink ears and feet and MY BABY BUNNY embroidered on the chest. It’s for my grandson, who is 4 years plus 8 months old. His mom purchased a new one over 3 years ago, and he got very attached to it. He naps, plays and sleeps with it. It’s getting worn out, and sometimes we go crazy when it gets misplaced. http://www.amazon.com/Ty-34505-MY-BABY-BUNNY/dp/B000BN8Z6W – AMAZON says 1 left in stock BRAND NEW.